Sandra Tanner is well-known as being a critic of Mormonism. (Some would even call her an anti-Mormon.) So why am I, an active Mormon, talking to her? Because she and her husband Jerald were the first people to question the authenticity of the Salamander Letter, a letter forged by Mark Hofmann that threatened the founding stories of the LDS Church. Mark Hofmann met Sandra Tanner with a mind to give greater publicity to his forgeries. Sandra describes her first meetings with Mark. In this first episode, we’ll get acquainted with her, and learn how she met Mark Hofmann. 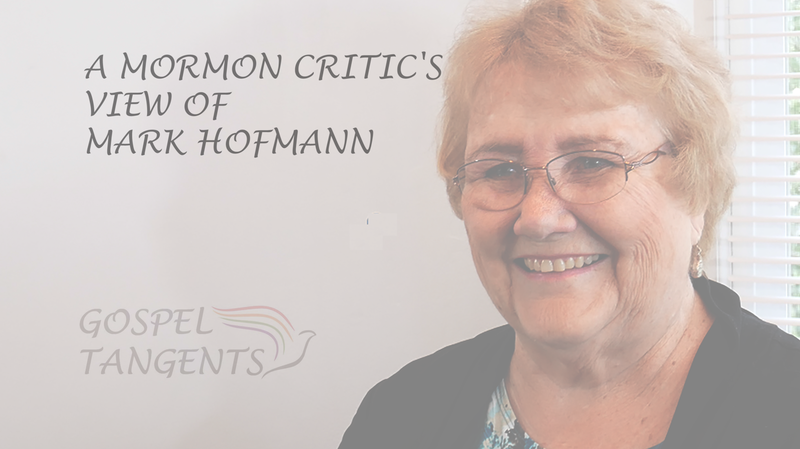 Sandra: My husband and I have been critics of Mormonism since 1959 when we got married and started trying to resolve conflicts in our own minds in Mormonism and we started publishing mimeograph stuff if anyone knows what that is. I find young people don’t even [know.] When I say mimeograph is like blank [stare.] Anyways, back in 1959, we started mimeographing off little sheets of paper, pointing out historical discrepancies in Mormonism, which evolved into in 64, setting up full time publishing and printing on Mormonism. He comes in and hands me a photo of a paper that is supposed to be a copy of the Second Anointing ceremony, temple ceremony…. this was a big deal to have someone to come in and have a photocopy of a document that purported to be from about the 1912 time period from the Salt Lake Temple about the Second Anointing. And it was a one sheet thing and it had a rubber stamp across the side that said Salt Lake Temple, which I assume Mark got made at the stamp company here in Salt Lake. And so here’s this document claiming to relate to the Second Anointing thing. And he brings it in to show me. and so this man who, I don’t know, he hasn’t told me his name. No, he can’t tell me his name because he’s from a very prominent family. And when his grandpa died, he was helping his mom clean out the attic and they went through his papers and he found this second anointing paper and realized that, wow, this was something he had never heard about before. And so he didn’t show it to the family and he has this copy and he wanted to give me a copy, but he couldn’t tell me who it was because he was this prominent family and you know, so it’s all on the QT, you know, so, so I’m buying this whole thing. And I mean not buying in the sense of paying money. We didn’t have it. We had zip money. We never got involved in these documents because we were not in that class of finances. But I realize now he was trying to establish credibility for this piece of paper. And I think by giving me this copy he assumed I would immediately pass it around to people and that would raise the value of it because others were talking about it, knew about it, see? But I didn’t because it had no provenance. I don’t know who this guy was. I don’t know the name of the family. Mimeograph was a copy technology that has been replaced by copy machines now. Don’t forget to check out our interviews with Curt Bench, Shannon Flynn, and George Throckmorton on the Hofmann murders.